History Heavily damaged by a mine in the Thyrhenian Sea off Italy, declared a constructive total loss. 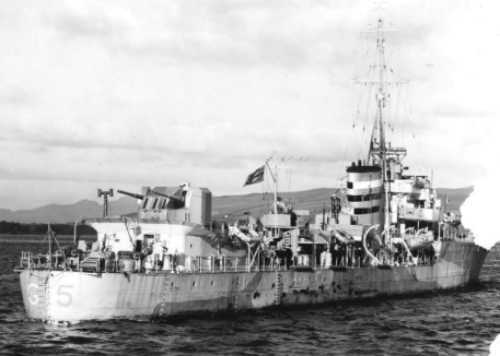 The British destroyers HMS Lightning (Cdr. H.G. Walters, RN) and HMS Loyal (Lt.Cdr. H.E.F. Tweedie, RN) sink the German (former Norwegian) Favor (1323 GRT) south of Sardinia, Italy in position 38º40'N, 09º32'E. The German auxiliary minesweeper M 6616/Alba Eder (21 GRT) and the Italian tug Porto Cesareo (230 GRT) were sunk off Cape Bon, Tunisia by gunfire from the British destroyers HMS Laforey, HMS Loyal, HMS Tartar and HMS Nubian.